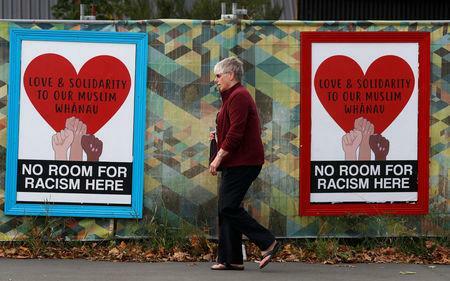 CHRISTCHURCH (Reuters) - The bullet-riddled Al Noor mosque in Christchurch was being repaired, painted and cleaned ahead of Friday prayers, as grieving families buried more victims of New Zealand's worst mass shooting. Prime Minister Jacinda Ardern has announced that Friday's call to prayers for Muslims will be broadcast nationally and there will be a two minute silence. "Police have been working relentlessly, doing everything in our power to gather all appropriate evidence from what are active crime scenes so we can allow people to return to the mosques as quickly as possible."